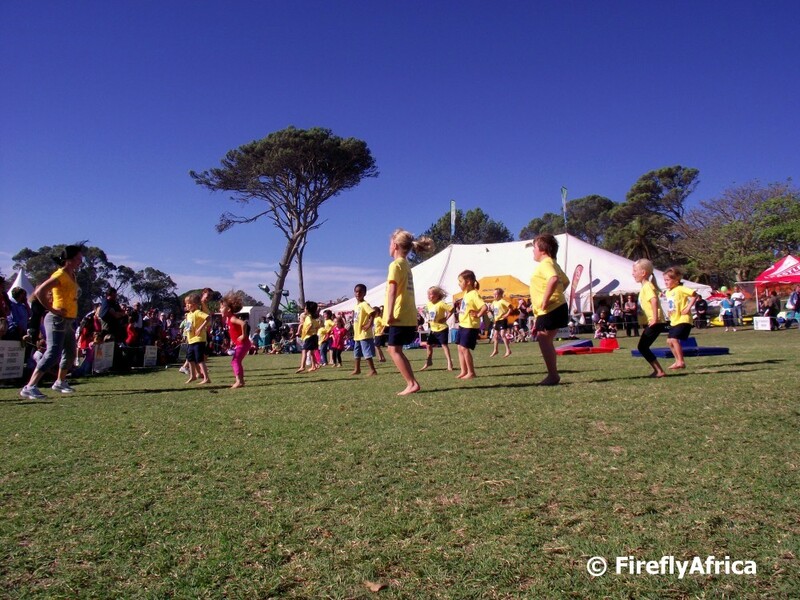 Drama Princess (in the long tights second from the right) belongs to a Trampoline and Gymnastics Club and her coaches also run the Jungle Gym Kids programme at various pre-schools and creches around town. They were asked to do a display in the main arena at Saturday's St Dominic's Priory Fate and the crowd watching them seem to have been amazed by the abilities of some of these little kiddies. In the photo they are busy with their warm up routine before doing their jumps and tumbles. The gym display was followed by a karate display. These two karate girls squeezed in in front of me for a better view and I though that it would make a nice picture showing them watching the gym kids. One of the most popular school fates in Port Elizabeth must be the annual Priory Fair at St Dominic's Priory in Miramar. 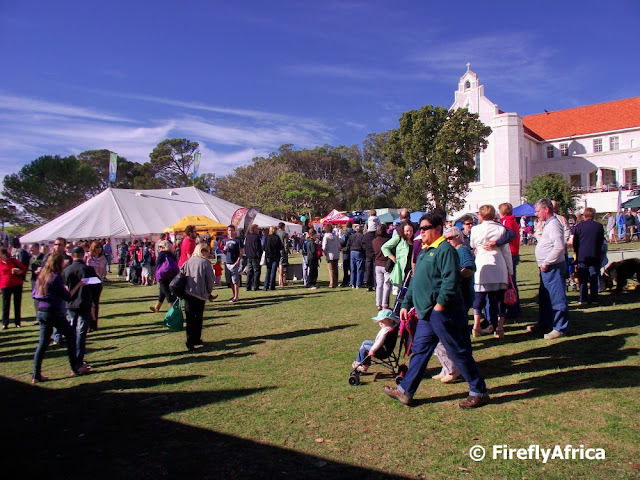 The Fair attracts thousands of people both connected to the school or just interested in what they have on offer. 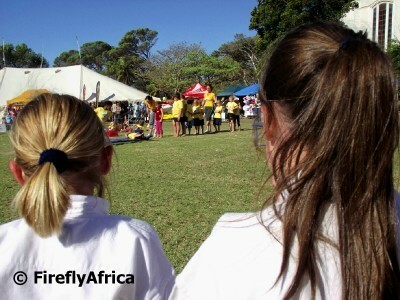 The school started out as a girls' convent school and then a junior school only. 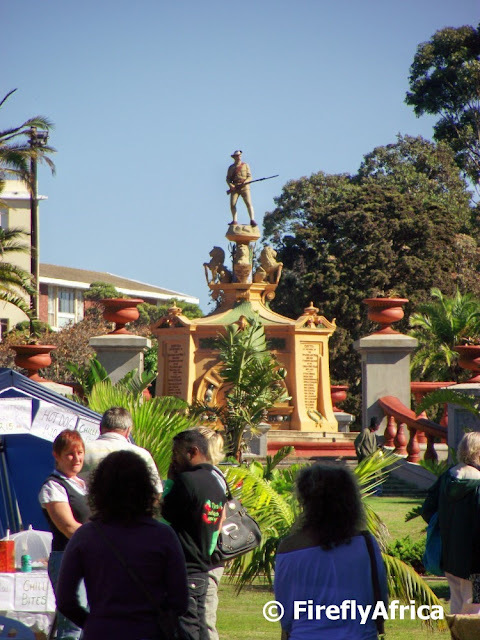 After the amalgamation of St Dominic's Priory with Marist Brothers College, Holy Rosary Convent and Trinity High, the school now has both a junior school as well as the only independent Catholic High School in Port Elizabeth. 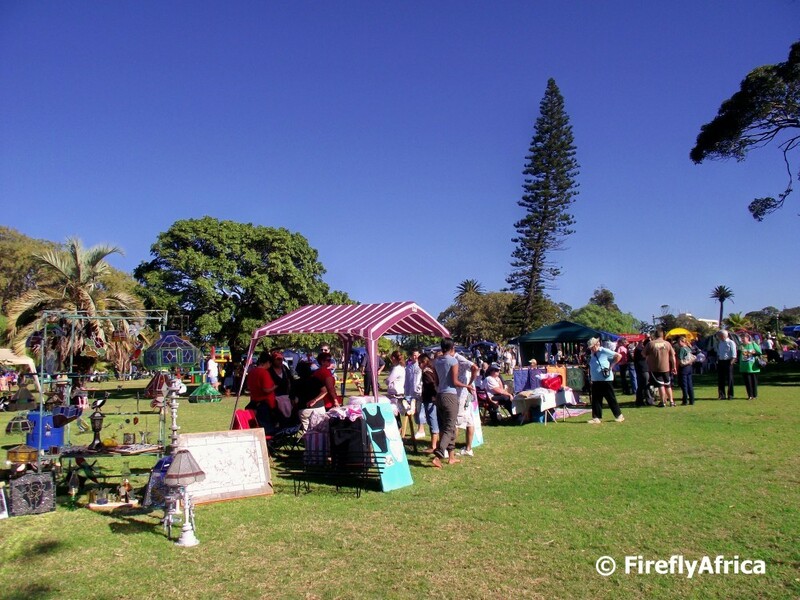 This year's fair was a HUGE success and the organisers are already looking at bigger and better things for next year. Firefly note: Yesterday when I initially did the post, I typo crept into the title and I spelled Dominic's with a "x" at the end. As soon as I posted it I noticed the mistake and corrected it. Unfortunately the post's web address is linked to the title and it doesn't change once the article has been posted. Mistakes do happen every now and then. Nobody is pervekt. 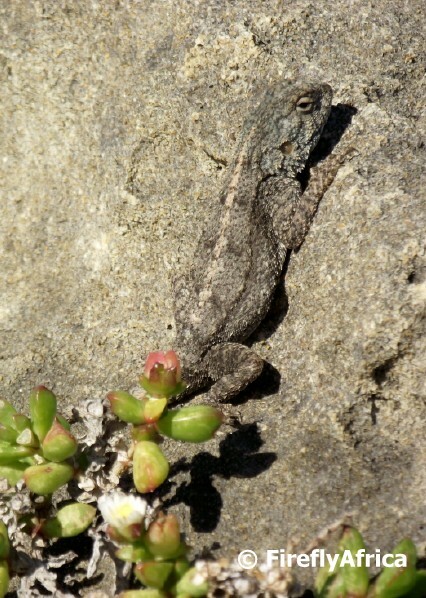 This lizard was sunning himself on a rock along the Sacramento Trail when he was rudely interrupted by a passing photographer shoved a camera lens in his face. I had to pop into the Walmer Police Station to pick up a document that I had been waiting for for more than three years already. At least I have it now. 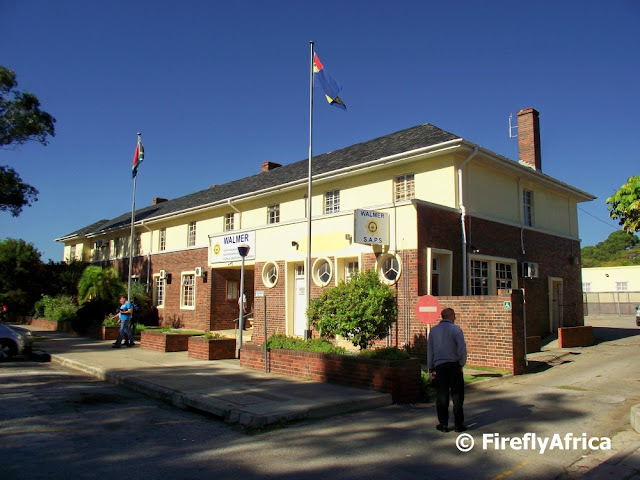 The police station covers a huge area that includes the suburbs of Walmer and Charlo. I couldn't find a lot of history on the police station itself other than the fact that Stephen Bantu Biko was detained here for 20 days in 1977 under Section 6 of the Terrorism Act before being taken elsewhere for interrogation. Below the monument marking the site where the Sacramento wrecked in 1647 I found what looks like the remains of a row boat or something. I have no idea what it is, but it was ironic that it was lying on the rocks close to the Sacramento's wreck site. When its hot, you go to the beach. So when you're a Red Hot Poker, perhaps a spot next to the sea would be an ideal spot for you. 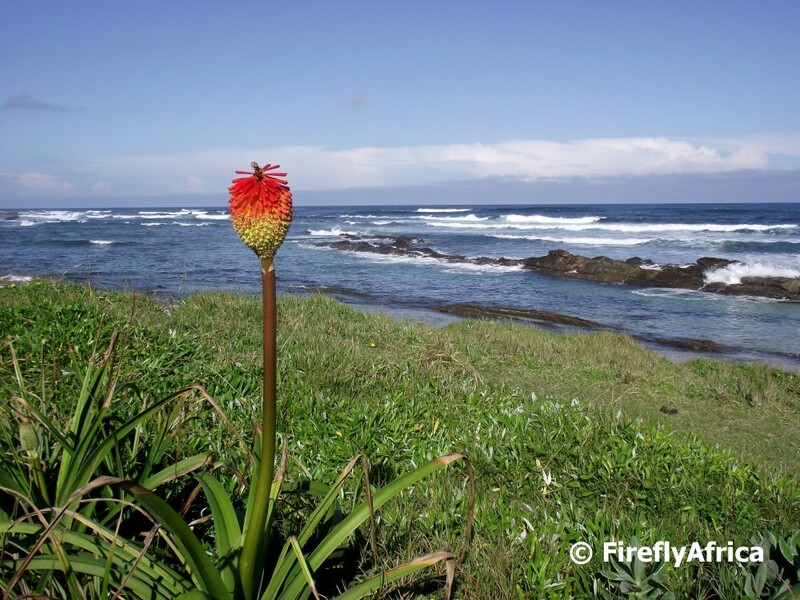 The latin name for the Red Hot Poker is Kniphofia and its also sometimes known as a Torch lily or Poker plant. 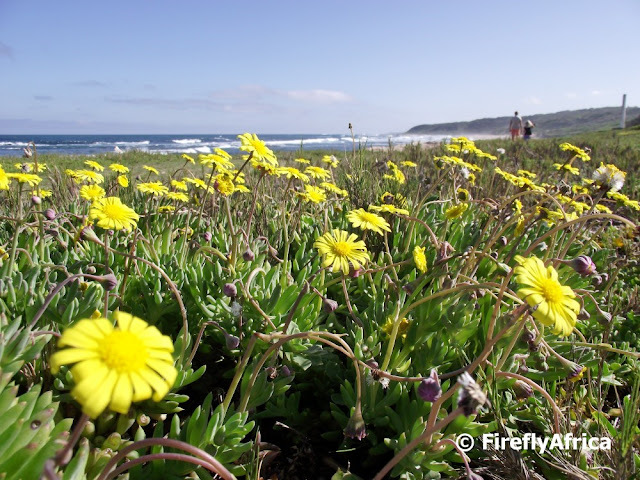 According the the clever people contributing to Wikipedia, it is a genus of plants in the family Xanthorrhoeaceae (I won't even try to pronounce that), subfamily Asphodeloideae that includes 70 or more species native to Africa. This specific one stands on the coast close to Schoenmakerskop just outside Port Elizabeth. 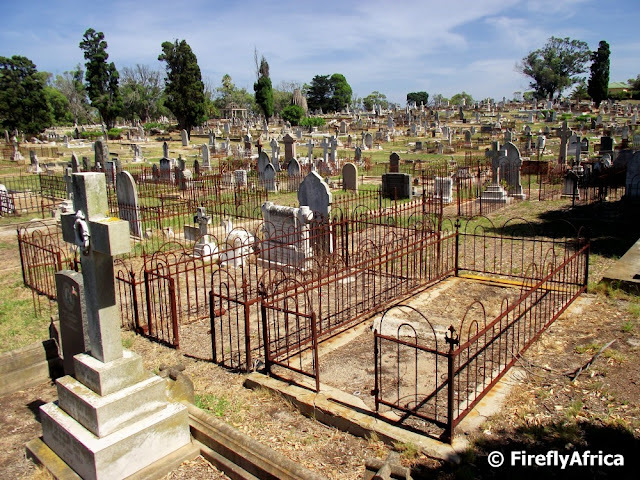 By now people who follow both my blogs should know that I have some kind of fascination with old cemeteries, not because I have a fascination with death but because you find the most interesting things in them. Every now and then I go and wander around the South End Cemetery which is near my office and I always return with some interesting photo or piece of information when. The South End Cemetery came into existence in 1882. At that stage each of the other cemeteries in town had been for a specific church or religion, while South End was meant for (just about) everybody. A simple fourfold division between Church of England, Nonconformist, Roman Catholic, and Muslim was adopted and this spatial pattern was retained in subsequent cemetery planning until the 1990s when the cemetery was full. After the picture in yesterday's post looking westwards from the Sacramento Cannon in Schoenmakerskop, I decided to post a picture of the same cannon but looking the other way. 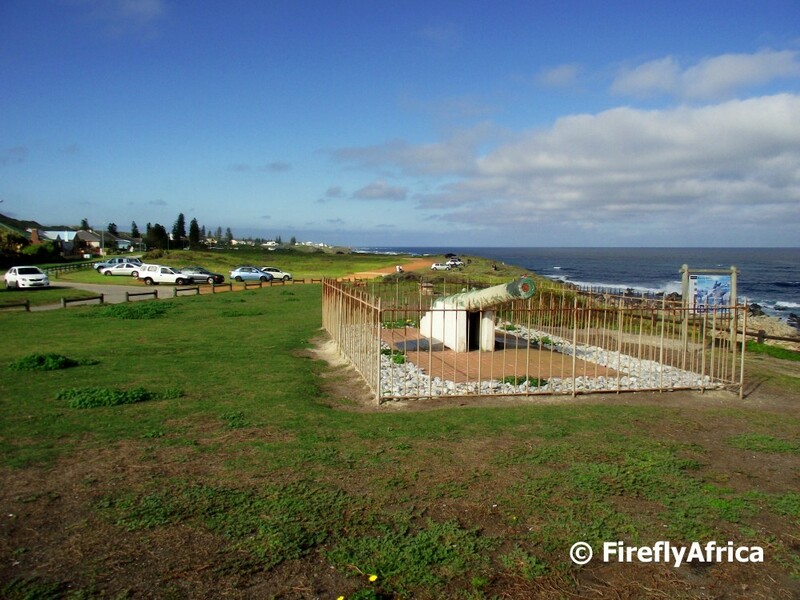 The cannon is situated at the end of the road in the village (its actually a suburb of Port Elizabeth, but because its slightly away from town and quite small the locals refer to it as a village) of Schoenmakerskop which can be seen in the background. If you are on Facebook I would recommend the group Friends of Schoenmakerkop to stay up to date with the goings on in the village along with some stunning photos from the area by Luc Hosten. 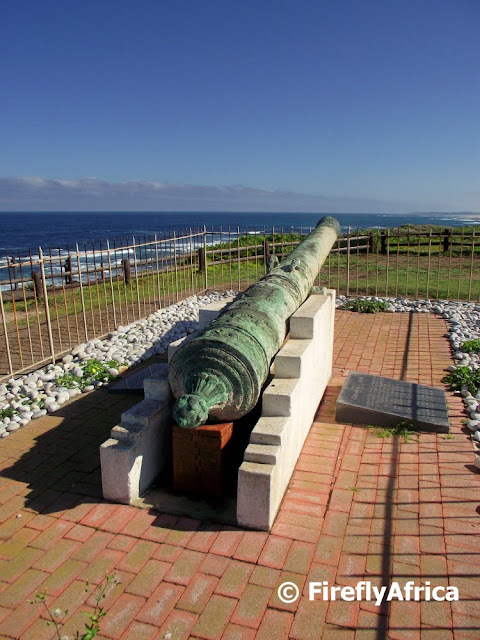 At the end of the road at Schoenmakerskop where the Sacramento Trail starts is one of the original bronze cannons that has been salvaged from the wreck site of the Sacramento. The Sacramento was a Portuguese galleon which foundered on 30 June 1647. 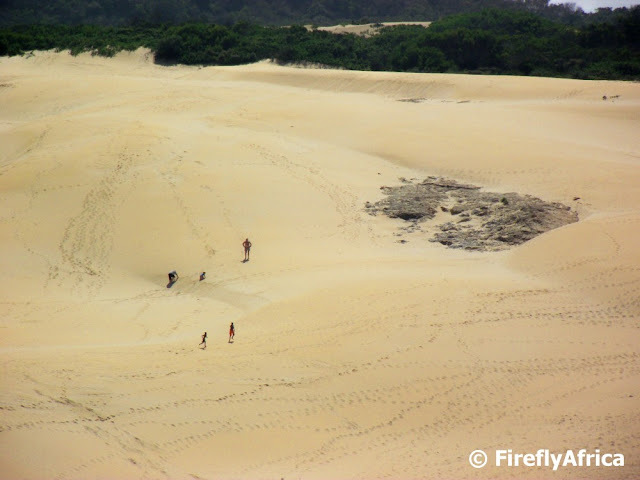 The 72 survivors who reached the beach set out to walk the 1300 km back to Mozambique, with only nine reaching Delagoa Bay (Maputo) and only four surviving the journey back to Goa (Far East). In 1977 local divers salvaged 40 bronze cannon from the wreck and this one has been set up as a monument pointing towards the wreck site. While walking around Art in the Park a couple of weeks ago I spotted an angle of the Prince Alfred Guard Memorial in St Georges Park that I have never photographed. One tends to always to to the memorials themselves for a photo, but seldom take one from afar with something else in the foreground. In this case its people and one of the stalls at the monthly Art in the Park. I love reading and I pop into the Walmer Library every couple of weeks to see if there is anything interesting on the shelves. I've been wanting to take a photo like this for a while now, but keep on forgetting. 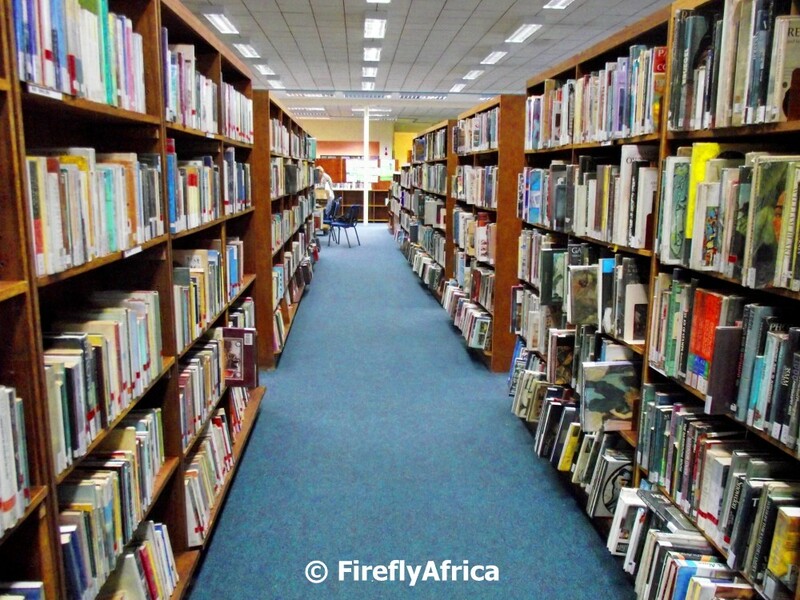 So here it is, a photo between the shelves of the Walmer Library. 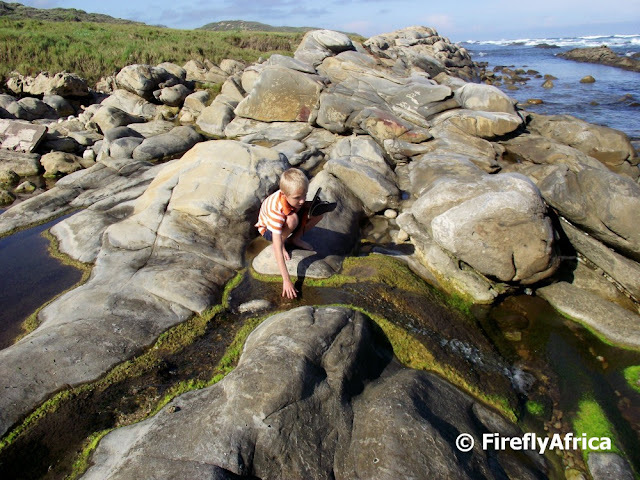 There are many fresh water springs along the Schoenmakerskop coastline with water collecting in little pools and running down to the sea. Here Chaos Boy is "testing" to feel how cold the water is on our walk along the Sacramento Trail. Along the Sacramento Trail you do find many rocks and stones and this one little stretch was very interesting as it is made up of stones washed smooth and round by years of wave action. 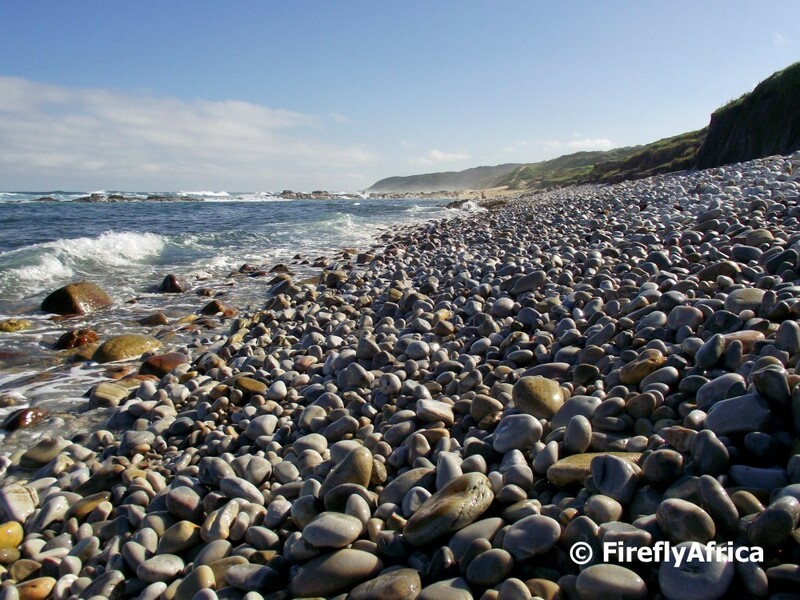 I wanted to call the post "Pebble Beach", but according to Wikipedia a pebble is a clast of rock with a particle size of 4 to 64 millimetres based on the Krumbein phi scale of sedimentology. So pebble was out of the question. And here I thought that I would get some extra hits from folks looking for Pebble Beach in the USA. 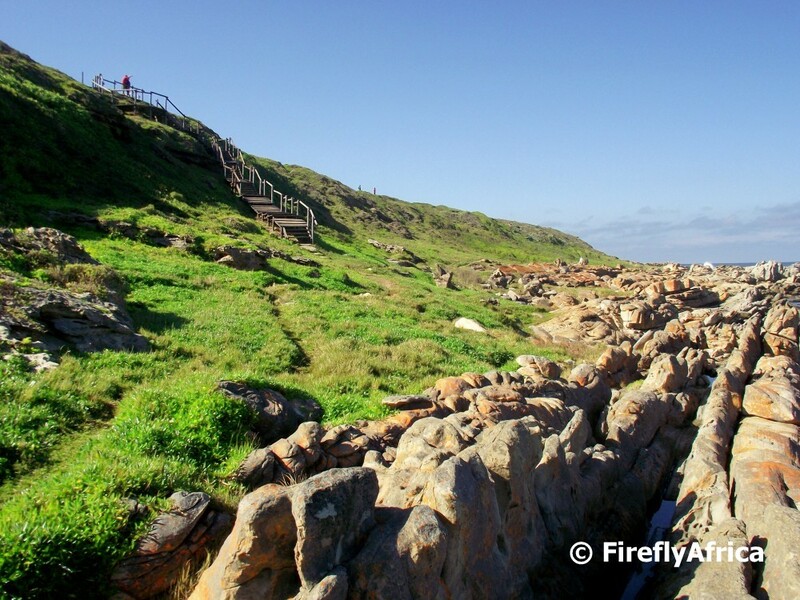 Yesterday's photo showed the wooden steps down to the coast at Schoenmakerskop which is one of the paths that start you off on the Sacramento Trail. After turning around from that view you make your way along the path through the rocks and over the little fresh water streams before passing over this spot. Once you are over these rocks the coastline stretches out before you towards Sardinia Bay which is about 4 kilometers away. 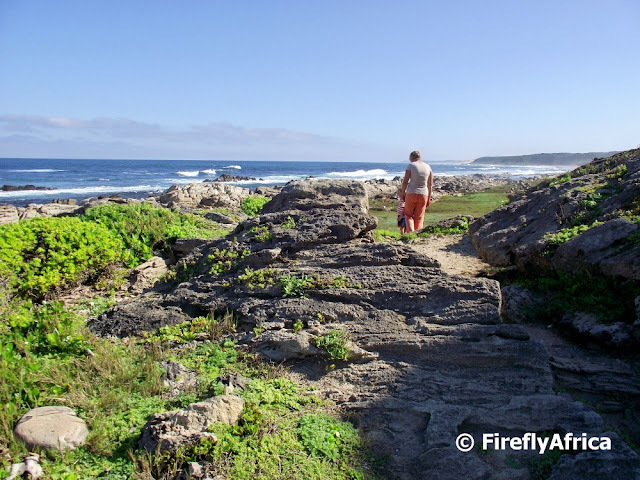 I have spent so much time away from home lately either on business or holiday, that I haven't done much around Port Elizabeth over the last month or two and thus has started to run out of PE photographs. Yesterday I just had to get out cause the house was closing in on me and the need for photos were shouting out very loudly. I bundled the family into the car and we headed down to Schoenmakerskop to do the first section of the very popular Sacramento Trail. At the start of the trail you can either walk along the top of the ridge for the fist bit or head straight down to the rocks. In the picture you can see the wooden steps that takes you down to the bottom. 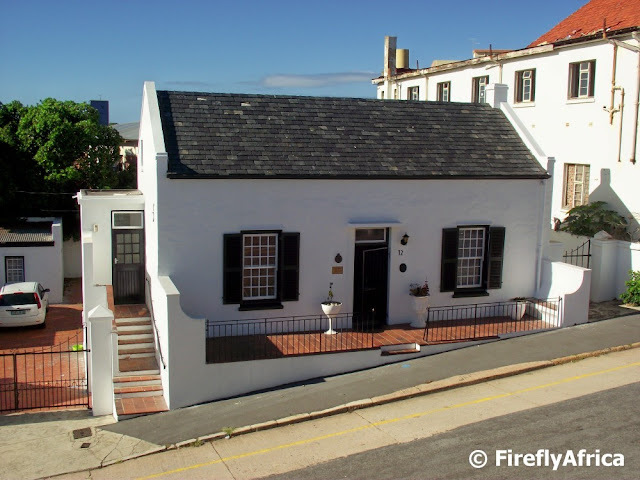 Accorss the road from the No7 Castle Hill Museum stands two historic houses known as the Sterley Cottages. The lower one (not in this picture) is one of three that was built in the 1830's and belonged to William Sterley. Two of the three were demolished some years ago already. Number 12 (in the picture) was built on land that was originally granted to Henry Jones in 1839. Both of these houses are national monuments and still occupied. 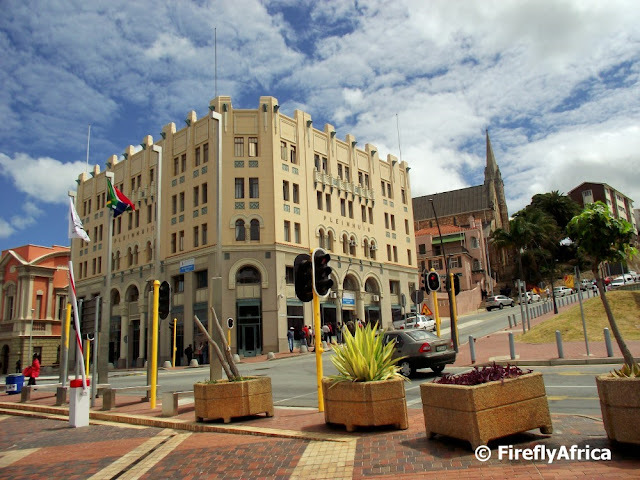 The Port Elizabeth Harbour is a major export hub for the car manufacturers in Nelson Mandela Bay with General Motors based in Port Elizabeth and VW in Uitenhage. This is the view from the Campanile down onto the harbour with rows car carrier ships. 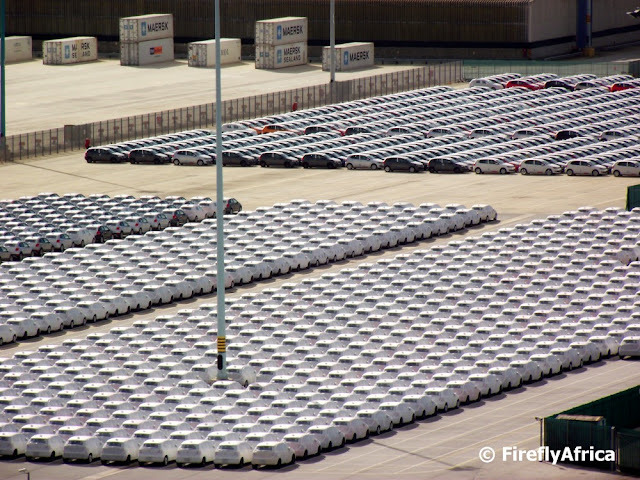 and rows of cars waiting to be loaded onto car carrier ships. This is the view from the Kings Beach side of Humewood Beach looking towards Hobie Beach and Shark Rock Pier in the background with the old Slipway at Humewood in the middle. Standing on Market Square there is a number of historic and interesting buildings surrounding you. I should actually do a whole series on that at some stage (now to just find the time to get down there and get some photos), but for now I'm just showing one of them. Pleinhuis (plein as in square as in market square and huis means house) is one of the prime examples of Art Deco buildings in Port Elizabeth and is utilised by the Nelson Mandela Bay Municipality. Here is something tongue in cheek. Some days I wonder if most photographers would be able to still spell cannon, as in gun and not camera make. 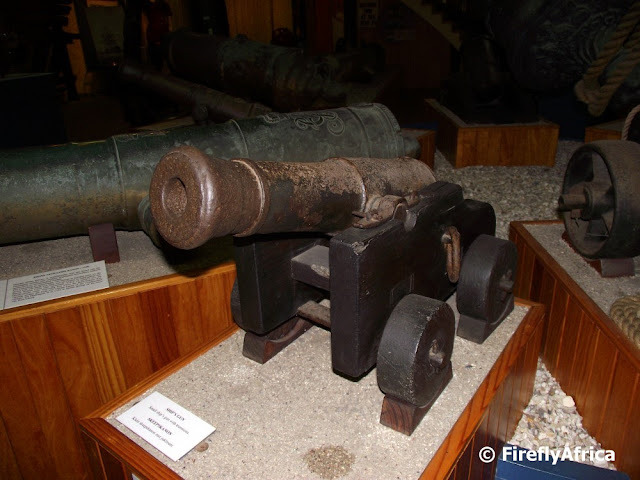 The picture is one of a collection of old cannons on display in the Shipwreck Hall at the Bayworld Museum. 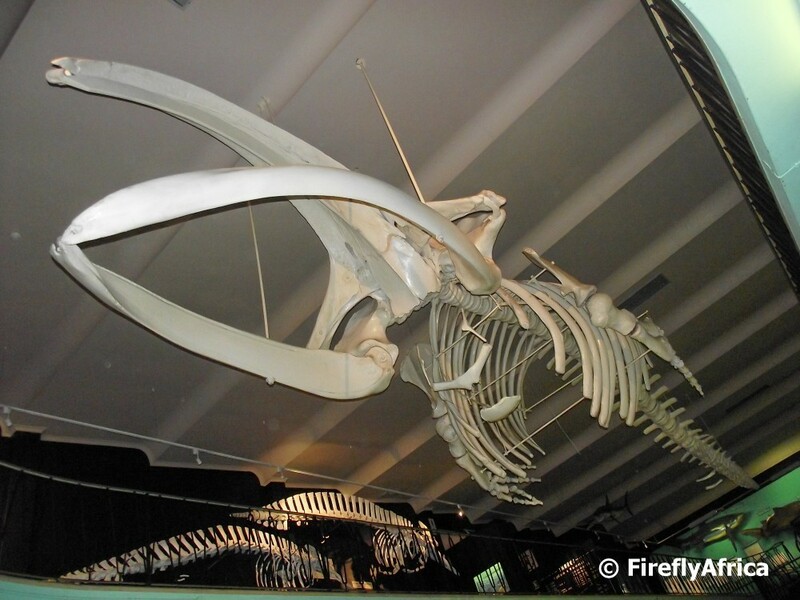 Looking up at the impressive whale skeleton on display in the Marine Hall at the Port Elizabeth Museum at Bayworld. 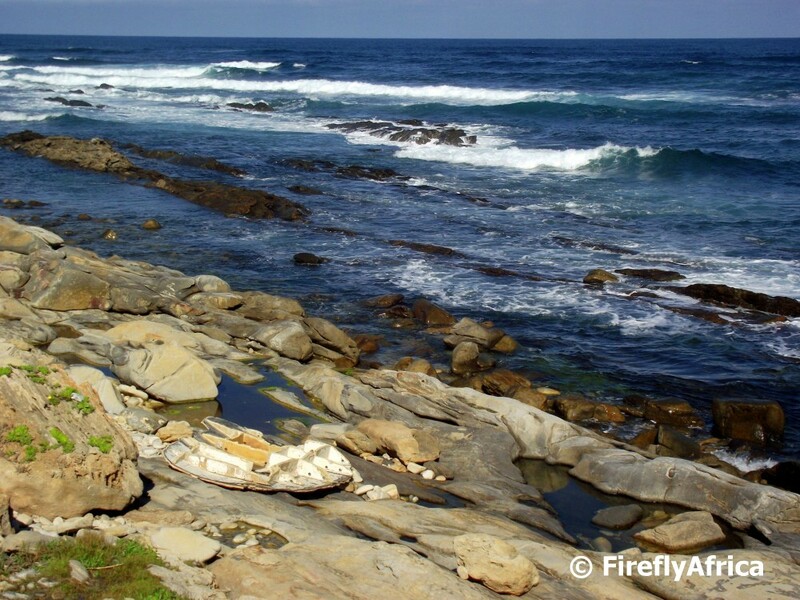 The skeleton belongs to the last Southern Right Whale to be hunted in Algoa Bay. 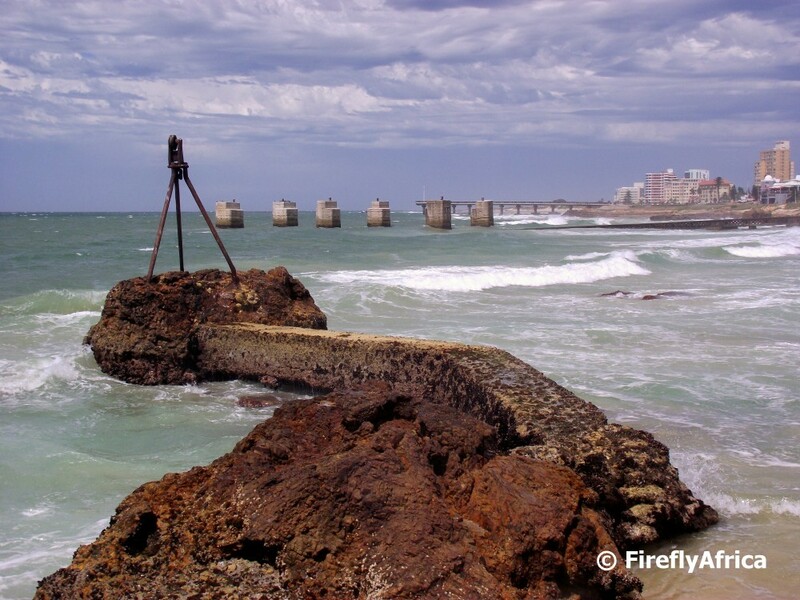 The area of Amsterdam Hoek at the mouth of the Swartkops River in Port Elizabeth got its name from the wreck of a Dutch sailing ship. The Amsterdam was wrecked on 16 December 1817 on an return voyage from the East to the Netherlands. The ship was beached after sustaining serious damage during a storm at sea. The original find of the wreck was made in 1985 with the latest big piece being discovered in 2009. 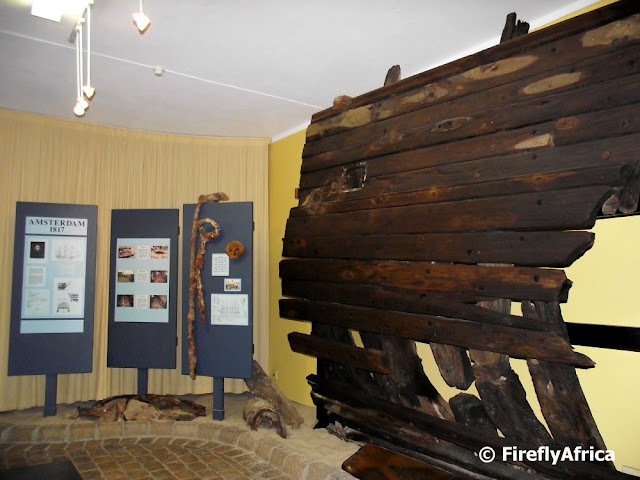 Pieces of the wreck of the Amsterdam as well as artifacts are on display in the Shipwreck Hall of the Port Elizabeth Museum at Bayworld. I've posted pictures of the Van der Stel Memorial Church (United Congregational Church) in Bethelsdorp before, but here's another one for good measure. The church was originally built in 1803 and has since been rebuilt and extended. 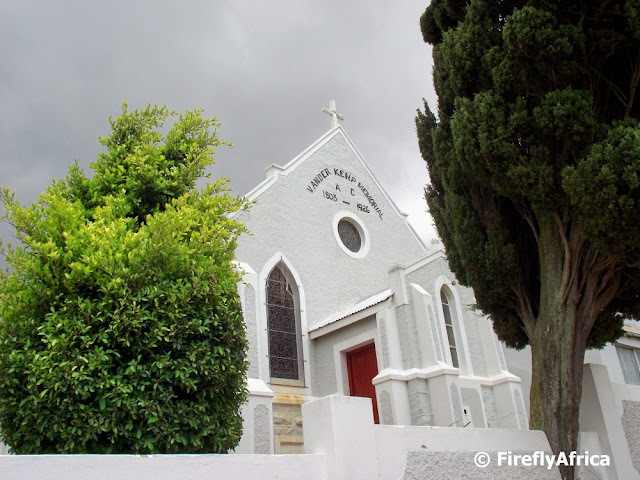 Its probably the oldest church in Port Elizabeth and is generally regarded as the first Congregational church in southern Africa. The paving patterns at the Boardwalk centre (not the Boardwalk Entertainment Complex where the Casino is situated but on the sea side of Marine Drive) at Hobie Beach. There are so many angles that you can take photos of the lights at the Boardwalk Entertainment Complex in the evenings. 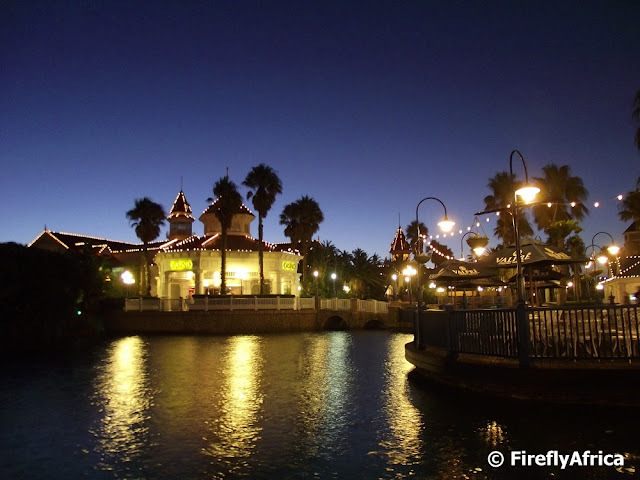 This picture was taken looking at the casino entrance across the Boardwalk lake. There was a light breeze, so the lake wasn't perfectly still which means that I will have to go back at some stage to get some perfect reflections. 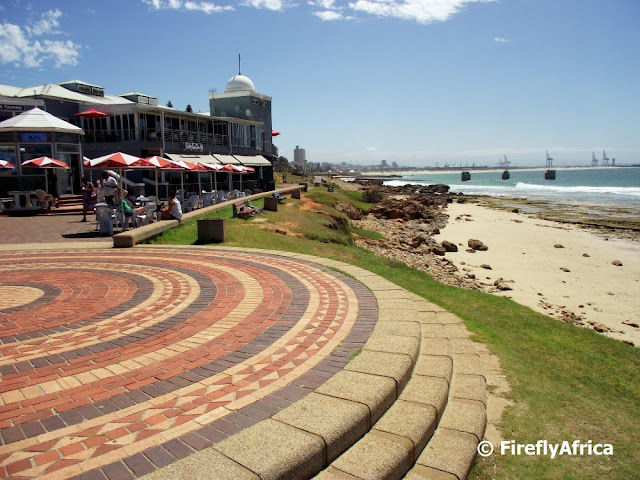 This is the view of part of the Port Elizabeth Harbour from Humerail and in this picture you can actually see quite a number of different harbour users. The big ship in the middle of the screen is a manganese ore carrier. 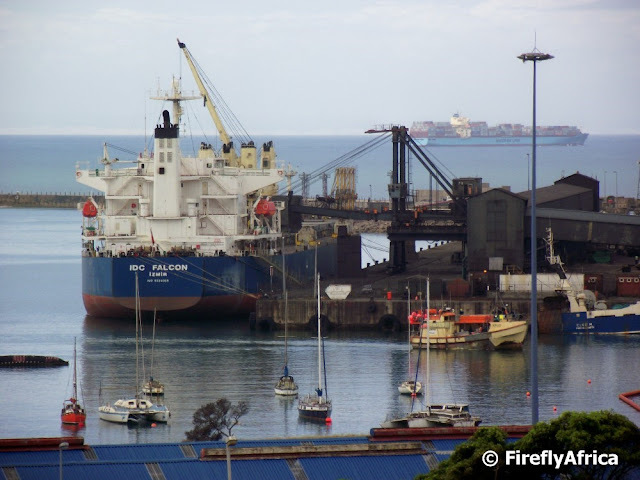 The manganese ore gets exported from Port Elizabeth and the whole issue of the manganese ore dumps is a very controversial one which can be discussed another time. Right in front of the ore carrier is a fishing boat coming in to off load its catch while yachts and catamarans can be seen anchored at the Algoa Bay Yacht Club in the foreground. Out at sea in the back is a container ship leaving port and sailing towards Cape Town. The weather was perfect on Sunday morning and we decided to pop down to Art in the Park at St Georges Park. In the past the market was all about home- and hand made items, but over the last couple of years less stall holders kept on coming back due to dwindling support. This forced the organisers to also allow bric and brac stall holders to start selling their wares at Art in the Park. I do find the bric and brac stalls very interesting though as you are always likely to stumble on a book or item that you want even though you may not necessarily need it. On this Sunday there were lots of people about which makes it an even greater pity that there isn't as many hand made stalls as in the past anymore. Looking up at the 53,5 meter high Campanile from its base. 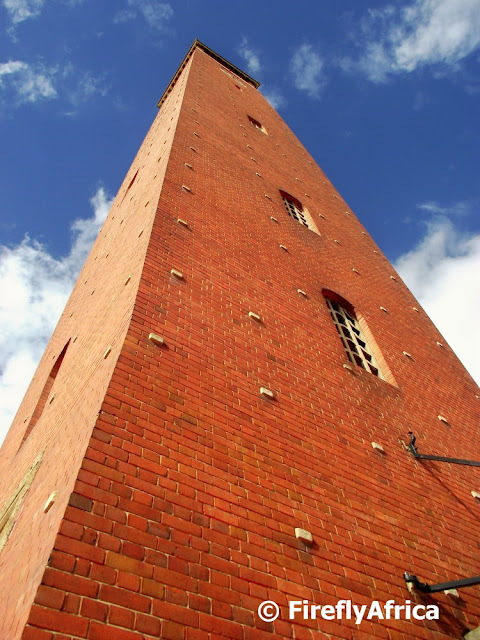 The Campanile was erected to commemorate the centenary of the landing of the 1820 British Settlers and contains the largest carillon of bells in the country. That is also where the name comes from as the word Campanile means bell tower in Italian. 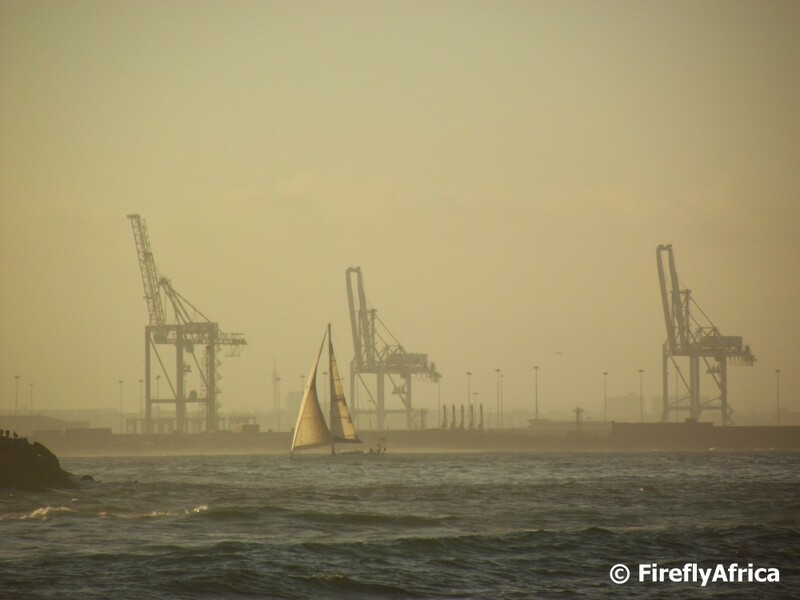 Today is Workers Day in South Africa and I thought I'll take the opportunity to post a relaxing "nothing to do with work" photo of a yacht sailing in Algoa Bay with the Port Elizabeth Harbour giraffes in the background.